Nadine Khouri live at the Folkroom. Photograph: London wYre. 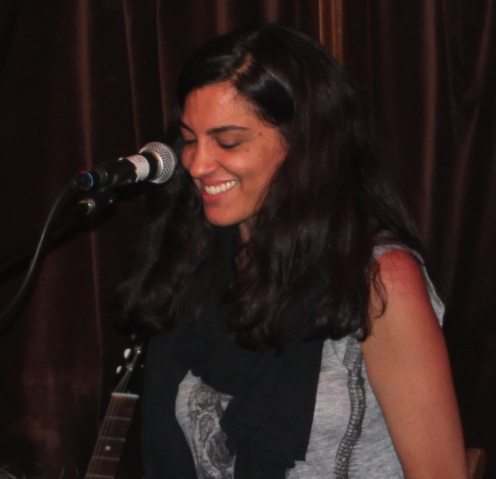 One could spend hours trying to describe Nadine Khouri’s music. I could try to give 50 musical references so it sounds sophisticated and pretend I know a lot about music history. For example, Nadine Khouri is Lou Reed feat Patti Smith Feat Radiohead but with a touch of oriental je ne sais quoi and Dylan’s acoustic sensibility. No. I will stop here, because I wouldn’t do the music any justice at describing how it sounds like. Nadine Khouri’s music is mesmerizing, whether it is the guitar, the ukulele, the violin or her unique, soothing, mystical voice. 9 pm. Folkroom’s intimate gig at the Harrison pub. Nadine and the violinist Basia Bartz go on stage and smile shyly. But as soon as the music starts, you’re suddenly taken on a Hogwarts train to another world of loss, pain and love. They’re wizards, Harry, they’re wizards. You can hear a pin dropping. Everyone is hanging on the lips of the singer. Everyone is on a cloud. On a cloud made of softly spoken words, Nadine’s voice and the delicious fusion of guitar and violin. The violinist masters her instrument, plays it subtly and with touching sensibility. Suddenly, you’re brutally taken back to earth. No…Is the song over? The gig was too short for the beautiful songs that were being played. You just want to listen to more. But this just tells you how good the music was. Nadine Khouri, who was the support act on Wednesday, definitely deserves a two hours concert that shows the full dimensions and scale of her musical world. You can listen to some of her songs here on Soundcloud. I particularly recommend: Salted air, To sleep, Rouge, Arms of Love, Blue of Princes. New single is out in October. New album out next year. Just listening to the samples Nadine played live yesterday, you can tell it is going to be special. ← Mistress America-Film review: A tale of friendship in a big big city.